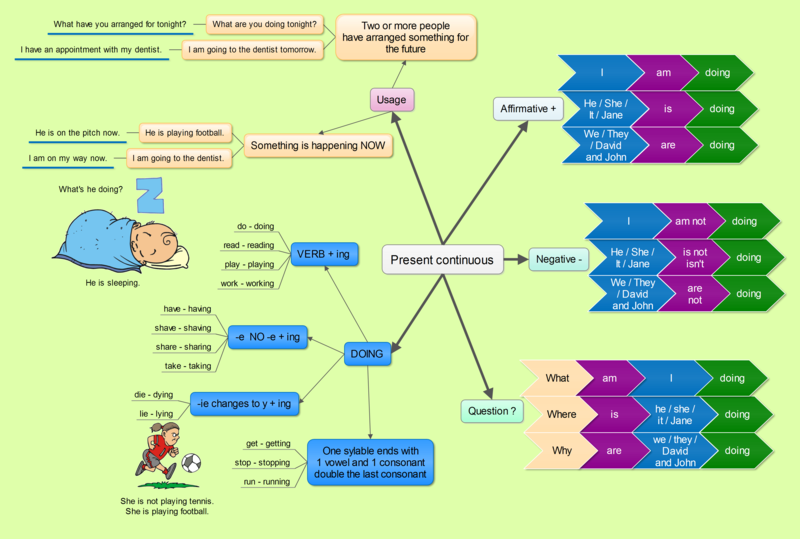 I have already published a post on Present simple and continuous tense here. However, as my teaching situation changed I realize that I need a slightly different type of materials and a bit more of them. So in this post I add the following materials: a Song, Speaking exercise, graphical explanation of the usage of the tenses, three interactive games and a worksheet. I hope you will find these materials really useful. I recycle the mind maps which I used in the previous post, because they proved to be really great even at my new school. 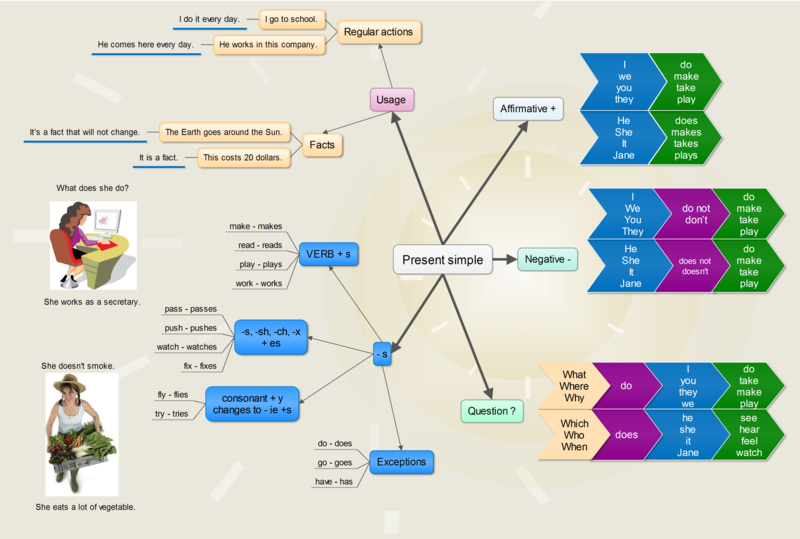 However, here is another graphical presentation of the two tenses. In the presentation I try to demonstrate the difference between usage of present simple and present continous tense. In my lessons I play the song and I ask my students to raise their hands when they hear present simple tense. Then I play it again and I ask them to raise their hands when they hear present continuous tense. First, I would like to practise present simple tense with my students. I have prepared the pair cards activity for them. Print out the following worksheet and cut it in the middle (from top down not from side to side). Ask the students to work in pairs. Each student gets 8 completed sentences and 8 sentences with gaps. Students read (they must not write anything) their gapped sentences and complete them with the correct forms of the verb HAVE GOT. Their partner listens and checks or corrects their answers (He/she has the full sentences). Once they finish they can swap their cards and start again. At the end of this activity I ask my students to choose 3 questions they would like to ask me. I answer the questions and then I ask my students to ask and answer the questions in pairs. All the other activities concentrate on the difference between the two tenses. The first one is a worksheet where the students should fill in the verb in present simple or continuous tense. The last three activities are interactive. First, there is a HTML5 version of the worksheet above. If you pass the test, you will be able to play the game called Angry Finches. The second interactivity is once again in HTML5 and it will play on any device. In this one you should fill in the gaps and if you pass the quiz you will be able to play the game Tic-Tac-Toe. This game is a bit of a challenge as there is just one way to win it. Can you find it? I love what you do with the mind maps and diagrams. I’ve used the HOW question one very successfully. I have just a tiny criticism of the songs on Tutor tunes. I love, really love the idea and the song you have here is very catchy but as far as I know the verb ‘to understand’ doesn’t exist in a continuous form. There was also a spelling mistake on one of the songs on their website. I do feel that as these songs are language teaching aids, the grammar should be correct. I have sent the company an email so they can correct the mistakes…. I’m sorry. I’m still learning your language, so I have many questions. At first pic, “present simle affirmative +”, the correct is “Jane play” or “Jane plays”? Congratulations for your job! It’s very usefull for us non native speakers. I have already corrected it. It is Jane plays. Thank you. I have been in doubt whether to use the song. I think it should be used only for demonstrating the form. NOT the USAGE or MEANING. Thanks for contacting them. Great activity and great song, but they shouldn’t have used she ‘s understanding. I have completed the quizzes. The second one says I have incorrect answers when I know they are correct. I am an English teacher and the answers given to me in the results do not make grammatical sense. Could you please specify the mistake and the test, please? There might be a typo or something. Thank you. Thank you for your reaction. I am not happy with some parts of the song either. I will contact the author and try to change it. l have no network connection in my class,how can l download this? I am afraid it is not possible. That is the disadvantage. Sorry.